Corel L091 Wire Chainplate for 7mm deadeyes - 36mm long - PK of 10 pcs. 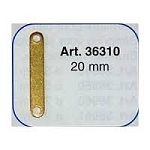 Home > Ships > Ship Model Fittings > Chainplate > Corel L091 Wire Chainplate for 7mm deadeyes - 36mm long - PK of 10 pcs. Corel L090 Wire Chainplate for 7mm deadeyes - 29mm long - PK of 10 pcs. Corel L092 Wire Chainplate for 5mm deadeyes - 33mm long - PK of 10 pcs. Corel L093 Wire Chainplate for 5mm deadeyes - 26mm long - PK of 10 pcs. Corel L060 Wire Chainplate with hinged attachment for 5mm deadeye & 30mm long - PK of 30 pcs. Corel L061 Wire Chainplate with hinged attachment for 7mm deadeye & 40mm long - PK of 30 pcs. Mantua Model 36310 Chain plate footer - brass - length 20 mm - Pkg. of 10 pcs. Mantua Model 42860 Complete Chain Plate for 7 mm Deadeyes - Pkg. of 10 pcs. Mantua Model 42870 Complete Chain Plate for 5 mm Deadeyes - Pkg. of 10 pcs. Mantua Model 42875 Chain plate - brass - length 15 mm - Pkg. of 10 pcs.